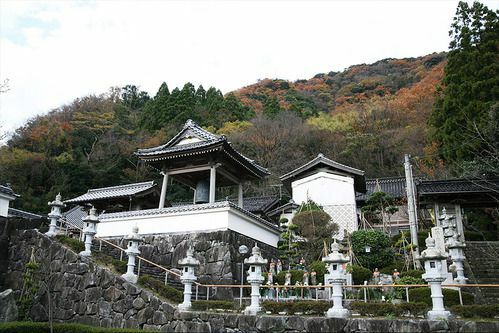 Sououbu-ji Temple was founded in 737 on a 245 meter high mountaintop. The buddha is enshrined with an eleven faced Kannon bodhisattva dating back to the Heian era, designated as important cultural property for the country. Every year, there is a spring festival held on April 18th and during Setsubun in February, there is bean throwing for prayer and good health. Since its founding over 1,300 years ago, the 13 degree Celsius healing waters of Kinsui and Ginsui is said to have made skin beautiful and cure eye diseases. Kinsui is to the left of the temple and Ginsui is to right. Around the mountain temple, there is thick lush vegetation growing in the forests.